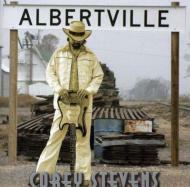 Corey Stevens is one of the most original bluesmen around right now. He continues to push the envelope on each record and known's no musical boundaries. Instead of putting out stale cover songs like most artists do today, most of his music is original that he wrote himself. He has staying power and more integrity than most of the new generation of blues artists trying to play tha blues. ALBERTVILLE is sure to be a classic blues album and 100 years from now, Stevens will be known as one of the legends of the genre.